Happy St. Patrick's Day! Today, to avoid the craziness that is Kansas City's St. Patrick's Day parade, I walked 40 minutes from my apartment to the Living Room Theater, where we rehearsed for THE MASCOT, a new play by Jerry Hickey and directed by Peter Zazzali. "The Mascot is a satirically comic coming-of-age story about an obsessive father, a starry-eyed son, and the drama that ensues when a father’s pursuit ofhis unfulfilled aspirations torpedo the dream of his son. The play’s unconventional and unforgettable characters will quickly prove if there’s one thing they can win at… it’s losing." I'm taking on the delightful role of Dia: she's dramatic, she's acrobatic, and she goes after what she wants without hesitation. I'm working alongside a stunningly talented cast, which includes Sam Cordes, Jen Mays, Matt Rapport, Hollis Wilhoit, Coleman Crenshaw, plus the lovely Alisa Lynn, and more! I'm thankful to be part of such a powerhouse team. 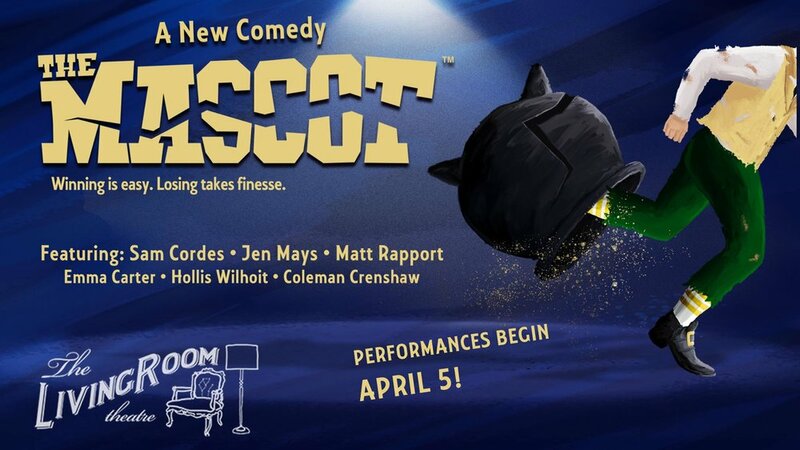 THE MASCOT runs April 5th - 29th at The Living Room Theater. Experience the mascot madness!